Originally Dowsing, in general terms, is the art of finding hidden things. The dowsing rod is a simple instrument .Taking the short end of the rod(s).Curl your fingers around the rod and it should now point out with the long end (the right angle to the piece in your hand) pointing away from you. This is the most effective way for holding a dowsing rod of this type. Easy tool for aura reading. 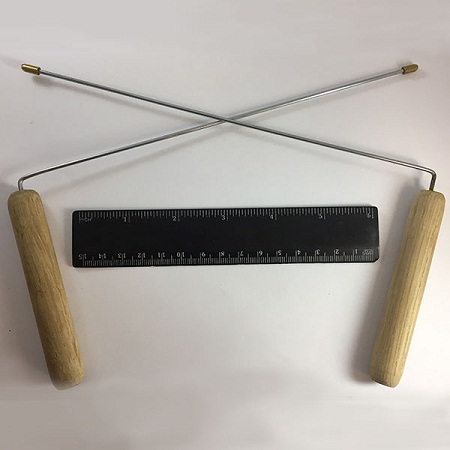 Holding and working with your metal divining rods In order to search for anything using a rod, you must clear your mind and then focus very clearly on what ever it is that you are looking for. It helps to say the name of the object over and over as well as visualizing it in your mind. As you walk the rods will move and point to another direction, carefully turn your body and follow in this direction. Your rods are now guiding you to what you are looking for. When the reach the area of the desired object, the rods will cross over each other in front of your body, indicating they have found what you were searching for.